Try something new with this Raspberry-Lemonade Pie Recipe. 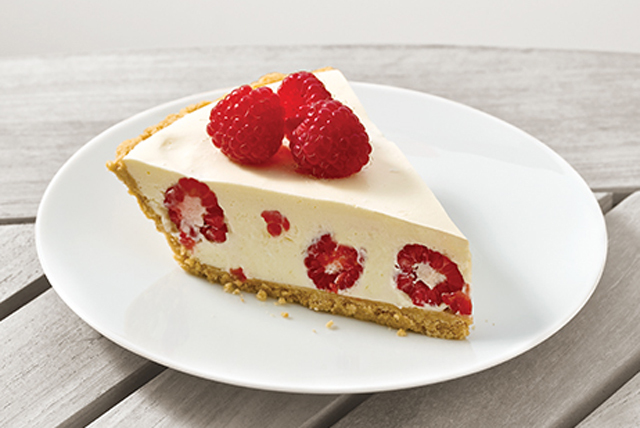 This sweet and tangy Raspberry-Lemonade Pie Recipe includes a crunchy graham cracker crust. Add boiling water to gelatin mix in small bowl; stir 2 min. until completely dissolved. Beat cream cheese in large bowl with mixer until creamy. Gradually beat in lemonade concentrate, then gelatin until blended. Add COOL WHIP and berries; stir gently until blended. Pour into crusts. Refrigerate 1 pie 4 hours or until firm. Freeze remaining pie up to 1 week before thawing to serve. Top pie with additional fresh raspberries. Pour remaining lemonade concentrate into 1-qt. pitcher. Add 1-1/2 cans water; stir until blended. Serve over ice. Prepare as directed with 1 pkg. (0.3 oz.) JELL-O Lemon Flavor Sugar Free Gelatin, PHILADELPHIA Neufchatel Cheese, COOL WHIP LITE Whipped Topping and a ready-to-use reduced-fat graham cracker crumb crust.